Our philosophy if you visit our East Sussex camping site it shouldn’t mean living without life’s little necessities. That’s why we’ve found a way to provide them and still be environmentally sensitive. The local councils in the area which our East Sussex camping site is located place certain restrictions on our operation as we are within the High Weald Area of Outstanding Natural Beauty (AONB). These dictate our site facilities: their size, our infrastructure and the amenities we may offer. Keeping every item we provide in our bell tents in mint condition in a woodland without a power source provides its own challenges. Using resources for their full lifespan is our ethos and a necessary practice in our small business. We endeavour to always provide clean, practical equipment and facilities, within the confines of our planning permission and the environment in which we operate. Yes we let you have a wash when you’re staying with us, although it’s a little different. 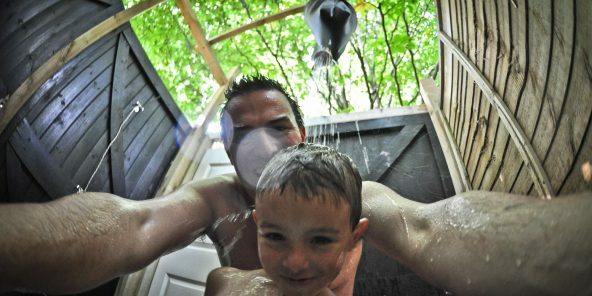 The campsite has seven unique hot water bucket showers (which everybody loves). Open at the top to look at the trees. Spacious with lots of room (so you don’t have to stand in a puddle while getting dry). We supply ecological body-wash to limit the impact on the environment. Our main toilet and facilities area has men’s and women’s flushing toilets. There is a men’s and women’s indoor shower. These are located alongside three bucket showers and two washing up points. Four hand basins with hot and cold water. We provide ecological hand soap and body-wash soap at all the facilities. 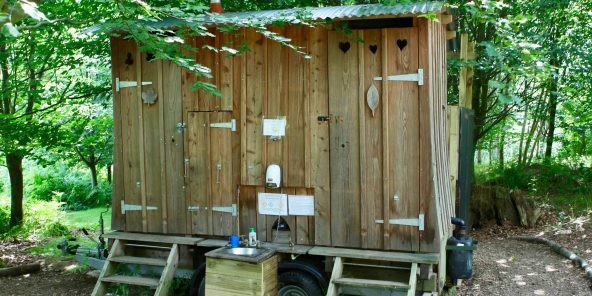 Our compost toilets have all been built by local carpenters and allow us to place facilities throughout the woodland. In years to come we will have some lovely fertiliser for the trees. We also have enclosed urinals alongside the compost loos for all the blokes! Each tent pitch and bell tent has its own open fire pit for cooking and relaxing around. We sell firewood from a local Sussex sustainable provider at reception. Grills and dutch ovens can be hired for your stay when you book or from reception (limited number). The open fires are designed as places for people to come together, cook food, swap stories, toast marshmallows and relax. Re-establish the lost art of conversation. 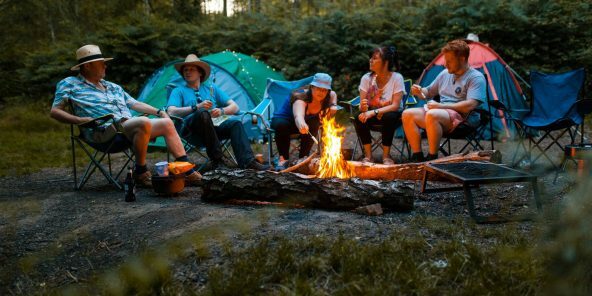 Campfires encourage you to meet new friends and renew old acquaintances. After dark, watch fire TV – the best show in the campsite. The Secret Campsite Beech Estate is located on a beautiful private estate. The campsite is spread over 20 acres on the edge of a 600-acre woodland in a 2000-acre private estate. 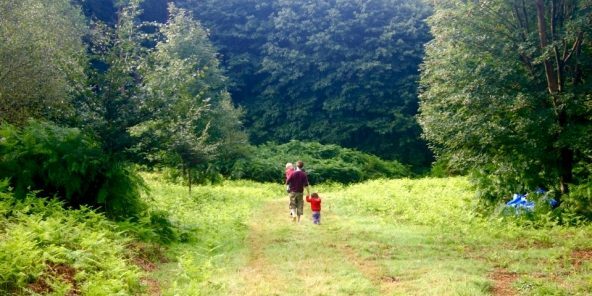 Our Eco Campers have exclusive access to the woodland with miles of forest rides to walk and cycle along. Great mountain biking in a beautiful woodland setting. British wildlife abounds, including deer, owl, rabbits, foxes, badgers, hawks and more. The campsite has seven drinking water points with mains water placed around the campsite. There are five washing up sinks. Hot water is supplied by gas hot water heaters located nearby. 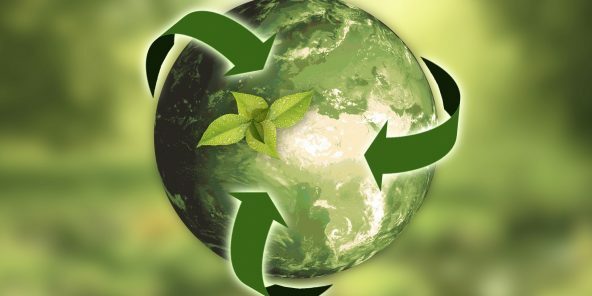 We provide ecological dishwashing liquid to limit the environmental effect. 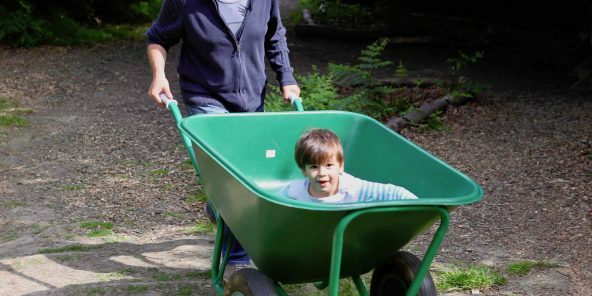 We have a fleet of over twenty 200-litre, double-wheeled barrows for you to transport your kit and luggage in and out of the East Sussex camping site. Once you arrive find our wardens at reception and they will give you a map showing your pitch location and point out the facilities and which direction to head. We prefer the ‘car free’ approach to camping as it keeps the campsite safer for children to roam. 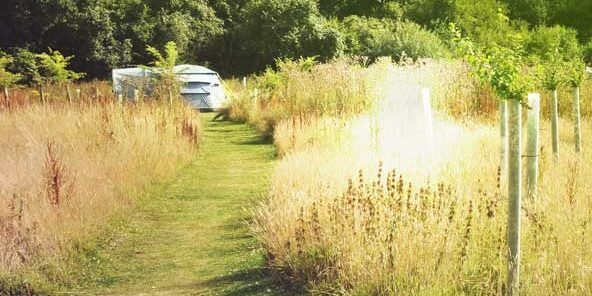 Our pitches are also inaccessible by cars as they are tucked within the woods. The added bonus is the lack of fumes and noise, and is far less disruptive on both the plants and animals living here full time. We try to have a low impact on the planet and minimise waste. We have plenty of recycling facilities on site where you can happily send your unwanted glass bottles, paper, cardboard, cans, cleaned metal and recyclable plastic bottles. The wardens also have a compost system in place for most food waste. We have a general waste disposal system for our glamping bell tent guests only. We ask campers to minimise the non-recyclable waste they bring to site and to take it home with you. The Secret Campsite Beech Estate is off-grid. 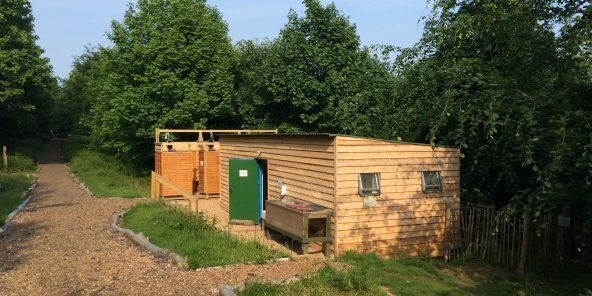 We do not use any mains electricity at the East Sussex camping site; lighting in the facilities is provided by solar lamps, wind-up lanterns, and low energy led battery units. We encourage you to experience a campfire – a renewable energy source for cooking and warmth. There is generally mobile and some 3G signal onsite, although it can be sporadic. We do however encourage campers to switch-off and minimise the use of devices.